To meet our site's higher standard of quality, this article or section may require cleanup. The keys and buttons used to control combat on all platforms are summarized in the Controls article. Learning how to use the controls quickly and fluidly is key to staying alive. To cause maximum damage during combat in Oblivion, you'll want to work on increasing one of the four attack skills along with its governing attribute. Strength encompasses the close-combat skills––Blade, Blunt, and Hand to Hand––and Agility governs Marksman. (See Weapon Damage Calculations.) The damage you do is further influenced by your Fatigue, the armor worn by your opponent, and other factors, as detailed in The Complete Damage Formula. Specializing in more than one of these skills at a time is often considered inefficient, as you may only ever use one weapon at a time. However, players wanting to take advantage of all of the equipment in the game may naturally want to select more than one of these skills as a major skill, or at the very least practice with them frequently. You also can go to trainers to help you with any of these skills rather than leveling yourself. A safe tactic for fighting in close combat is blocking enemy attacks and striking while your opponent recovers. Because maneuvering this way is very safe and since your enemy cannot easily get a solid blow in, this contrivance is effective for players who are new or inexperienced with combat. To make this slightly easier, you can hold down the block control when you attack, and your character will resume blocking once they have finished their attack. Shields are more effective at blocking than weapons, but both can be used. Still, your block skill is what ultimately decides how much damage you take when you are blocking. The main drawback with the previous technique is that enemies who can also block will often keep their guard up until you stop blocking, and only attack then. To avoid this, you can stand without blocking as your enemy moves toward you, and once they are about to attack quickly block. Doing so does not give your opponent a chance to be careful, as they have already begun attacking. To do even more damage with this, instead of just hitting your opponent as they recoil you can circle behind them to get a few hits in. When fighting slower enemies or enemies that attack slowly, moving backwards and forwards as you block and attack respectively (using the first technique mentioned) can help you avoid being hit. Moving backward as you shield will avoid your enemy's attacks, either because as they move forward to attack they prove too slow to keep up with you or because their attack is slow enough that you have time to move out of the way while they ready it. Then, when you attack, you move forward to close the gap between you and your opponent. Note that if you avoid being hit at all, your enemy will not recoil (being that they only do so when they hit your shield), so they may block when you move forward to attack. When using a melee weapon, pressing the attack control will perform a normal attack and holding it for a second will perform a Power Attack. There are four different types of Power Attack - Standing, Left/Right, Back, and Forwards. The attack you perform depends on which way you move as you attack. For example, if you were moving left when you performed the Power Attack, you would perform a Left Power Attack. In the beginning of the game all of these attacks have the same effect, considerable damage at the expense of speed, but different animations. As your skill with Blade, Blunt or Hand to Hand increases, you will gain perks that allow you to perform Master Power Attacks. The details of the Mastery perks can be found on the Blade, Blunt and Hand to Hand skill pages. If you are fighting an enemy that doesn't want to approach you such as an archer, keep your shield up until you hear or see him shoot at you. Wait for the shot to hit your shield and fire back or advance on the archer and raise the shield again when he shoots another arrow. Note that this won't work at all for spellcasters; raising your shield against spell attacks has no benefit whatsoever. If you are fighting an enemy that doesn't want to approach you such as an archer, and your character has some speed to them, moving left and right repeatedly, as rapidly as possible, will almost always throw off the aim of archers and spellcasters. This is because they shoot where they expect players to be based on how they are moving at the moment of attack, meaning they expect the player to continue to run in the same direction left or right. Alternatively, if you can time it right, side-stepping can dodge most projectiles with relative ease, but you must be aware of your surroundings, especially ledges and traps. This is also the only way to reliably avoid magic attacks. If you are fighting in an area with a taller rock or ledge you can use this to an extreme advantage. With a high enough acrobatics skill, jumping on top of the rock/ledge will allow you to heal up for round two or pull out your bow and make target practice out of your foe. You can also use any object to move around and play tag with an enemy and heal up while they chase you. Another great combat method is circling. Put your guard down until your opponent strikes you. Block their attack and immediately pull to the left or right and begin circling around them while attacking. Given your speed is high enough and your performed it correctly, your opponent will stand pivoted and try to face you by turning the wrong way allowing you to move in unison while you attack from behind. When fighting Hand to Hand, let the other character swing wildly at you while you back-pedal. This allows for them to greatly reduce their own fatigue making it possible to knock them down with one strong punch. This works especially well against enemies using two handed weapons that consume more fatigue to wield and take longer to return to a defensive position. When using a staff hit enemies from a distance so that you can be better protected. There are a plethora of tactics one could use with the game's various weapons, the most effective often depending on what attacks the foe uses. Different weapons have different reach, weight and speed characteristics; for example, longswords have a medium-long reach and are relatively light, making fatigue drain minimal. Maces are the 'longswords' of the blunt weapon category and are generally heavier, draining more of your fatigue per attack. However, blunt weapons in general often have higher base damage and weight, the latter of which causes enemies to be staggered more often. The easiest tactic is to block and strike. The recoil from the enemy hitting your shield will stun them long enough to get at least two hits in (or sidestep as mentioned above). Also an effective way, is blocking your enemy's attack, and attack them while moving around them. Your enemies are usually too slow to turn around quick enough, which will cause you to strike more than twice. This requires a bit of practice, but when you master it, it can be very useful. Unless you are out of your league and get constantly knocked back or disarmed, in which case running would be a wise idea. If you have been diligent with leveling up your speed and endurance, you can dance in and out of a fight. Step back when the enemy swings, staying just out of range, and then dance in to place a quick blow with the tip of your sword. This tactic is more difficult, as timing is essential. If you attack too slowly you are going to hit your enemy's shield and be stunned yourself. Two-handed weapons do considerably more damage than their one-handed counterparts and usually have greater reach. However, they can be very slow, and nearly all two-hand blunt weapons in the game are notoriously slow at recovering from a swing. But because these weapons are so strong, they often kill your foes quickly. When using power attacks you have to plan your attack because you don't move as quickly as you normally would and people have time to dodge the swings. When fighting two handed attackers you will want to wait for your opponent to wind up a Power Attack, dodge it, and then hit them as they recover. The easiest way to kill ranged weapon users is to get in close. Charge in and either ignore the projectiles or block at the absolute last second. If there are no other enemies around and you have a good amount of armor, charging works the best. You are a fighter after all and a little damage won't kill you. If the ranged user is a mage, start sidestepping in one direction while they are casting, the second the projectile emerges, sidestep the other way (they will anticipate your move and overcompensate). Once you're up close to the ranged user, rapidly attack until the enemy is dead. Note that while archers and marksmen will often fight with a melee weapon when you get close, magic users often don't have such weapons, and so just run away - and their lack of armor makes them difficult to catch up with. 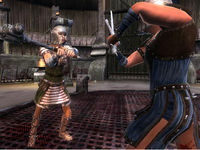 Some players may find it easier to fight a ranged opponent with a bow, as arrows move fast enough to catch enemies with minimal movement compensation required. However, if you insist on using melee weapons against spellcasters, keep in mind that your shield will not defend you against spells. Therefore it may be more beneficial to switch to a two-handed weapon, in order to deal maximum damage, since the lack of a shield will cause no detriment to your blocking when battling a caster. Foes may also use staffs against you. There's a few ways to deal with this. One way is to run up to your attacker and kill them with melee weapons while getting hit a few times by whatever spell the staff uses. A different strategy is to zigzag from side to side, avoiding the spell, but letting the enemy drain the staff's power. The third way is to use a bow, a ranged spell, or your own staff to take out your foe. Summoners are often weak and easy to kill. They rely on summoned creatures to fight their opponents, and usually stand back to protect themselves. Killing them first will make the creature disappear, but it may be difficult getting to them if what they summon is very powerful. In this case, it is best to distract the creature with your own to give you time to attack the summoner. Hand to Hand strikes do little damage compared to weapons and have an extremely short reach. However, they're fairly rapid, and do direct damage to your opponent's fatigue - with help from Destruction magic, Hand to Hand makes knocking your opponent out much simpler than using poisons as you might with weapons. Note that Hand to Hand attacks can never gain enchanted effects or be poisoned, but they never need to be repaired (your fists have infinite durability). To use a shield, you must have a one-handed melee weapon equipped. A shield increases your armor rating if equipped, whether you are blocking or not. You cannot change weapons and armor while attacking. (Swinging a sword, shooting an arrow, punching with your fists, or casting a spell). You cannot repair items while in combat, or while enemies are nearby. You cannot make potions with enemies nearby. You can assign weapons and spells to hotkeys for quick selection during combat, or you can press the Open Journal button to pause the game and select a new weapon from your inventory or a new spell from your spell list. Bringing up the hotkey feature does not pause the game, so be sure to move while you try to select the right weapon, or memorize which hotkey has which weapon or spell. Keep in mind that the brute force techniques are not the only way to fight your way through Oblivion. You can also create a character that mainly uses magic. (See below for the Magic Characters Basic Guide). It is imperative to keep your weapons and armor prepared and ready for battle at all times. Always carry a stockpile of repair hammers. After several fights your weapon could be doing half damage, making fights last longer and the chances of you getting killed greater. It is recommended that you repair your items every chance you get, even after every fight. It's expensive and weighty at first, but once the armorer skill goes up, a pile of 10 repair hammers will last 3-4 dungeons. Once your armorer skill reaches 75 and you become an expert you can improve your items to 125% durability. This will give your weapon an extra 2-4 damage points, and your armor an extra 1-3 points. It might not seem like a lot, but once you start fighting with a Daedric weapon at 125% condition, you'll notice your enemies dying a bit faster. If you find you're fighting an opponent that refuses to stop blocking, remember that even a basic touch spell will damage them and cause them to stop blocking momentarily. You can use filled soul gems to recharge enchanted weapons and staffs. Archers have the advantage of not having to face an enemy at close range, thus eliminating the need for heavy (and noisy) armor. Sneak and Marksman go hand in hand in this game, so be sure to sneak when attacking, it'll give you a 2x damage bonus at the Novice level in Sneak, or a 3x damage bonus for Apprentices! Note that when sniping from great distances aim above your target or your arrow may hit the floor. Combining all of these tactics will usually result in instantly killing an enemy. Even if it does not kill the enemy, it can severely soften them up for the inevitably ensuing close quarters combat, where you would otherwise be at a severe disadvantage. You'll want to go for light armor, or if you're feeling really confident, regular clothes. Staying well out of your enemy's range and making sure it doesn't see you before you land your first hit is critical for a good start to any battle. Note that once your Marksman skill reaches 50 you gain a new ability; zoom. This is your most useful asset as an archer, since it gives you the option to stay even further away from your enemies. The enemies you'll encounter can generally be divided into four types: Bandits, Fighters, Mages and Archers. All bandits wear light armor, making them easy opponents. If the bandits are in their wilderness camps, you can sneak your way into an appropriate "sniping" spot (e.g. a large rock, as enemies cannot jump) and preemptively begin the fight. Even though bandits wear light armor, it may take quite a few arrows to bring them down, and you will have to retreat when they near your position. Bandits usually use blunt weapons, which can give their attacks a bit more weight than their oft-meager strength can manage. The most common type of Fighters are Marauders. Fighters usually wear regular heavy armor, but sometimes carry enchanted gear. These enemies are worthy opponents, especially in a dungeon where you have little space to evade their melee attacks. The strategy for taking them down is basically the same as Bandits, but you will end up using many more arrows, and if you are stuck fighting them in close quarters, you may be in trouble. If a Fighter is giving you a beating, you should bring up your inventory and poison your next shot (if you have any poisons). Poisons are best saved for big fights like these, so save them when you get them, as they can make the difference between life and death. Another way is to walk in circles, evading the enemy while you shoot them. You can also "rush and retreat." Rushing in stops an enemy's advance and triggers strike motions, and retreating gets you out of range after you loose your arrows point blank. This is especially effective against zombies and skeletons. The best way to bring down a mage is to get the advantage of surprise. Try to get a critical sneak attack and reduce their health as much as you can, as you never know what mages will pull out of their hat. They will most likely use a combination of destruction magic and conjuration, so run from the summoned creature and concentrate all of your arrows on the mage. If you kill the summoned creature, the mage may summon it again, but if you kill the mage, their summoned creature will die with them. This battle will be similar to an archer battle, as both mainly fight at range. They usually aren't too difficult to bring down, as they have no armor, but beware that they will probably heal themselves when you've hurt them enough. You might want to use a silence enchantment or poison in order to cripple their fighting. You may also use a staff; this can be useful as it does not require any magicka. Additionally, if the enemy gets close you can use it to block. If you are using a staff when fighting with any ally, however, it is more than likely they will get hit, especially when the staff has an area effect. Azura's star or a healthy supply of soul gems is required when using staves due to the often low charge, so a character skilled in soul trapping and summoning is recommended. When two archers are engaged in battle, the fight is usually slow and sloppy, as many shots will simply miss their targets. A good trick is to wait with drawn bow until the enemy stops to draw back his own bow, because at this moment he will stop moving. After you shoot your arrow, step aside to not get hit by your opponent's shot. This way you can kill the enemy without getting hit at all. Quicker players might actually find this easier. When a shot does manage to hit, it will do good damage to its target, as archers - excluding Marauder Archers - wear light armor. Do your best to dodge the enemy archers' shots, and draw your bow back all the way, for maximum range and damage. Rushing is another good options as it causes opposing archers to switch to melee mode and they usually have a dagger which does less damage than their arrows. Simply backpedal and fill them with arrows then. The good thing about fighting a fellow archer is that once you have killed them, you can go loot all of their arrows for your own need. For the archer who does not want to use poisons or custom enchanted bows. The drain speed effect on the best quality Hatreds Soul bows (combined with high Sneak skill and/or partial chameleon), can distract enemies long enough in one shot for the player to switch to a Daedric bow or depleted Hatreds Soul bow and make the kill with a moderate number of arrows. A Daedric bow repaired to 125% shooting steel arrows will kill a level 50 goblin warlord (1500 HP) with fourteen arrows this way, or fifteen in all. For characters that specialize in magic, it is a good idea to have at least one combat skill early in the game. Many spells that are necessary to survive as a mage are not available until you are proficient in that school of magic. This is especially true for Illusion spells, as effective Frenzy, Demoralize, Invisibility, and Chameleon spells do not come into play until you are a Journeyman. The same applies to Restoration, since enemies will soon become too difficult for the starting spell Heal Minor Wounds to be of any use. Alchemy is a very important skill for a magical character. A powerful Alchemist can make many potions that fortify and restore magicka so they can keep casting away at their enemies. An even more important thing is that you will be able to make poisons that really pack a punch, especially at lower levels. You'll probably need to take time finding ingredients and memorizing recipes to get the most out of Alchemy. The school of Alteration includes many utility spells that are useful in certain circumstances. There are spells which allow you to open locks and breathe underwater. It also includes the Feather and Burden spell effects which can be occasionally useful, and the effective Shield series of spells. Conjuration is an extremely powerful skill to have later in the game, as you will be able to summon very powerful creatures, such as Daedroths, to assist you. The skill can also be a great help early on - the Apprentice level Summon Zombie spell can keep Bandits at a distance for quite a while at low levels. Conjuration also has a turn undead spell that will panic and disperse low level undead, such as zombies and skeletons. This is very useful, especially if you are dealing with multiple opponents. Destruction is useful for obvious reasons. It is the powerhouse of all of the magic skills. Destruction includes spells that cause direct damage to enemies. You'll mainly be using elemental spells if you decide to use Destruction - Fire, Frost and Shock. At higher levels, you might also find a use for Damage Health, as it's rarely resisted. Illusion spells include some of the most useful spells in the game (such as Invisibility) that can get you out of a tricky situation and save a lot of frustration. Would you rather sneak your way through a dungeon swarming with guards, getting caught every two seconds, or comfortably sprint through to your objective while invisible? A high level illusionist can also mix one or two seconds of paralyze into a destruction spell, stopping enemies (those without resistances) in their tracks as you damage them. Illusion becomes far more useful at Journeyman level - you may want to constantly cast Light on yourself to help increase your skill level. At Apprentice level, Illusion doesn't help you out much. It's important as it includes the Soul Trap spell that allows you to recharge your weapons using soul gems, or create new magical items. Detect Life can also be an immensely useful spell effect. Effects such as Reflect Spell and Spell Absorption only kick in at high levels, but they can be extremely useful at that point. You just need the patience to get there! Restoration can be important for all types of characters, as it is one of the two main ways to heal yourself or allies (among other effects). Restoration should arguably be a major skill of every character - however, potions aren't too rare, and the Heal Lesser Wounds spell you begin the game with is one of the more magicka-efficient spells, especially at low levels. If you're using Destruction, when you begin to make a living in Oblivion, purchase a well-balanced array of Destruction spells. For example, as an Apprentice of Destruction, you should buy one spell of each element that you are able to use (Fire, Frost, Shock). Ideally, you would progress through the early Mages Guild quests to gain access to the Arcane University, and create better spells of your own design as you progress. Do not neglect to level one of your magic skills, as it will fall behind and become useless later on if you do. If your character is focusing on magic, remember that armor lowers your Spell Effectiveness - heavy armor especially so. If you plan to bypass this by wearing no armor at all, invest in some Shield spells, or something like Invisibility, or enemies will kill you very easily up close. Remember that you can cast magic and fight with a weapon at the same time, so don't be afraid to fight close quarters until you are wounded and then drop back and finish your enemy off with magic. There are many advanced magic techniques that can be discovered and used as you will. Be on the lookout for unusual spells that could be useful in combat or fun to cause mayhem in town. One-handed weapons allow you to carry a shield, which is more effective at blocking than a weapon alone. One-handed weapons are generally faster and lighter than two-handed weapons. One-handed weapons are generally cheaper than two-handed weapons. One-handed weapons allow you to carry a torch at the same time as your weapon, provided that you do not use a shield. One-handed weapons allow you to sneak attack. Some one-handed blades, such as Goldbrand or Umbra, are among the most powerful weapons in the game. One-handed weapons are generally less powerful than two-handed weapons. One-handed weapons generally have a shorter reach than two-handed weapons. One-handed weapons tend to have less health than two-handed weapons, causing them to break more frequently. Two-handed weapons are more powerful than one-handed weapons. Two-handed weapons have a longer reach than one handed weapons. The enchantment from a shield can be used without reducing Spell Effectiveness. Two-handed weapons have more health than one-handed weapons, allowing them to last longer in drawn-out battles. Although a shield can be equipped to use its enchantments, it cannot be used to Block or contribute to your armor rating. Two-handed weapons are more expensive than one-handed weapons. Two-handed weapons do not allow you to carry a torch at the same time as your weapon. This can be a problem in dark caves if you do not have spells, potions or enchantments for Light or Night-Eye. If you sneak attack with a two-handed weapon you will not get the sneak attack damage bonus. Punches damage enemy fatigue, while only minimally consuming your own. You do not need to spend money on weapons. You are not encumbered or slowed down by weapons. You cannot be disarmed, making fists always effective in combat. There is no need to repair your weapons because your fists cannot be damaged. You can carry a torch when fighting with fists. You gain all the perks of the block skill while blocking with your hands, while never having to train your block skill higher to achieve them (i.e. at mastery level you have a chance of disarming your opponent). After becoming a Journeyman, your punches ignore Resist Normal Weapons. You can still evade and move around if under recoil, as opposed to weapons. Nothing makes your punches more powerful, unlike weapons, which can be upgraded. You cannot enchant your fists with damage spells. Hand to hand users do not gain defense bonus from their equipped shield. All weapons reach further than punches. Hand to Hand is weak at lower skill levels, and does not get much more powerful. Once you become a Master, holding down the block button will automatically trigger your counterattack. This makes it very difficult to yield to friendly NPCs. Spells can be used at range. Spells can inflict more damage than the most powerful unenchanted blade. Conjuration can be used to call assistance to your fighting. Spellcasters can still use weapons, shields, and armor. Many creatures have weaknesses to certain types of elemental magic (mostly Shock). Spells can greatly assist in non-combat quests as well (such as stealth quests). Spells cost Magicka, and once a mage runs out of magicka and potions to restore it, they will have to resort to retreating or fighting close quarters. More powerful spells usually have to be made (requiring access to either the Arcane University or Frostcrag Spire with a working spellmaking altar) or acquired via Spell Tomes, which is not a reliable method due to the low chances of getting a specific tome. Some creatures are impervious to certain types of elemental magic. Spell bolts move slowly compared to arrows, and it is therefore quite easy to miss moving targets with them. Conjured creatures are not very powerful at lower levels. Spells do not benefit from sneak attacks. It takes much time to be able to use the most powerful spells. Ranged spells are useless in water and underwater. Bows are used at range. Arrows are the only type of weapon or spell in the game that cannot be reflected. When combined with sneak, arrows are very powerful. Bows can be enchanted and poisoned, and enchanted arrows can be found. When used in combination, they are deadly. You have a 50% chance of recovering an arrow from your opponent's corpse. Likewise, any arrows that hit you have a 50% chance of being added to your inventory; if the material is the same as what you currently have equipped (iron, steel, etc. ), you instantly have them at your disposal. It is easier to make sneak attacks with a bow, for you do not need to get close to your enemy. Arrows never suffer from wear, however, bows do (except on a PS3, in which case bows don't suffer from wear when firing). Bows are ineffective at close range. It is hard to hit moving targets. You may run out of arrows when you need them most. They can be expensive to buy in large quantities, and without them you'll be forced into close combat. Arrows can only be fired a short distance in water, effectively rendering them useless in combat against enemies while you are underwater. Arrows cannot be retrieved when used against summoned creatures except against skeletons or any creature that normally doesn't "collect" arrows. Enchanted arrows disappear when they hit a creature, and if you miss they disappear in about three seconds. Unlike melee weapons, magic bows use charges every time they are fired, regardless of what they're fired at. Also, poisons are used the next time a bow is fired, even if the arrow misses its target. Once nocked, it is impossible to put the arrow back into the quiver. The only method of retrieving a nocked arrow is to shoot at the ground and pick the arrow back up. This becomes problematic when combined with the aforementioned poisons and enchanted charges. When you die, you will briefly enter a third-person camera centered on your corpse, and then must select a save file to load. Note that attempting to resurrect the player either through console commands or scripts will result in game-breaking bugs. See the bugs section for the Molag Bal quest and Sheogorath's Protection spell for details on when this might occur. This page was last modified on 4 January 2019, at 00:30.